Today in Masonic History George IV (George Augustus Frederick) is born in 1762. 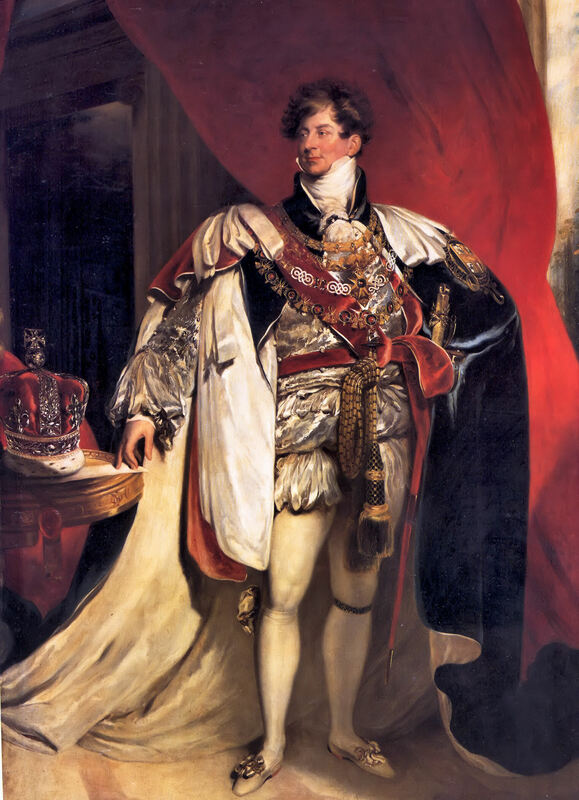 George IV (George Augustus Frederick) was King of the United Kingdom of Great Britain and Ireland. George IV was born in London at St. James Palace, the oldest son of George III. He would automatically become Duke of Cornwall and Duke of Rothesay at birth. He was created Prince of Wales and Earl of Chester a few days after his birth. George was a talented student and would lean to speak French, German and Italian. George IV was a sharp contrast to his father. Where is father led a scandal free life, George IV at the age of 18 was given to wild extravagance and heavy drinking. It was said that he could carry on an intelligent conversation drunk or sober. By the age of 21 he would be given an annual income of £50,000 from his father as well as grants from Parliament. Despite the large sums of money he was given (most of the amounts he was given are in the Millions of Pounds in adjusted currency for today), he would quickly get himself into debt. Eventually his father would stop providing him with an income and he would forced to leave Carlton House. At the age of 21, George became infatuated with a young Catholic woman, Maria Fitzherbert. By English law, the two could not be wed without the express permission of the King. George and Maria would ignore this and would wed anyway. Their marriage would be kept secret though to avoid a scandal. Maria would insist that the two were married and that the law of the sacrament of marriage overruled the law of the land. In 1788, George III began to suffer from the effects of porphyria, a disease that causes madness and a reduced mental function. This left Parliament in a position where they could not conduct business since they operated by authority of the King. It was eventually decided to make George IV his Regent, this led to fighting between members of Parliament. Eventually they would come to an agreement and moved forward with the bill to make George IV Regent. Unfortunately this led to another problem, the bill could not be ratified without the Royal Seal and that would require the King. It was decided that the Lord Chancellor would affix the seal, despite it being an illegal act. Shortly after the King would recover and he would declare the actions taken by Parliament and the Lord Chancellor as legal. In 1795, George IV would pushed to marry his cousin, Princess Caroline of Brunswick. The couple were not well suited to each other and would living separately almost immediately. They would have one child together Princess Charlotte who would per-decease George IV due to complications in child birth. When George IV would ascend to the throne, Caroline would come to claim her position and authority as Queen Consort. George refused to acknowledge her and initially sought a divorce. He was convinced by friends and political associates that he should drop the idea of a divorce since his behavior would be called into question as well. Caroline passed away shortly after George's coronation, before she passed away she believed that she had been poisoned. In 1810, George III fell ill again from porphyria. The same bill was brought forward again to make George IV Regent. He was officially named Regent on February 5th, 1811. George III would pass away in 1820. George IV would ascend to the throne with no real change in power since he had been the Regent for almost a decade. By the time George ascended to the throne his life wild extravagance and heavy drinking had caught up with him. He was obese and was something of a recluse, possibly because of the ridicule he came under when he showed himself in public. It was also believe that he was addicted to laudanum a pain medication which contains 10% opium. George's reign would last only 10 years. He would pass away on June 26th, 1830. As his passing approached he would repent his misspent youth, confessing to an archdeacon. On the day of his passing he suddenly called out "Good God, What is this?" he grabbed the hand of his page and said "my boy, this is death" and passed away. George IV was Grand Master of the Premier Grand Lodge of England from 1792 to 1812. He was also the Grand Master of the Grand Lodge of Scotland from 1806 to 1820.